BERKELEY, CA  Make way for the real nanopod and make room in the Guinness World Records. A team of researchers with the U.S. Department of Energy’s Lawrence Berkeley National Laboratory (Berkeley Lab) and the University of California at Berkeley have created the first fully functional radio from a single carbon nanotube, which makes it by several orders of magnitude the smallest radio ever made. 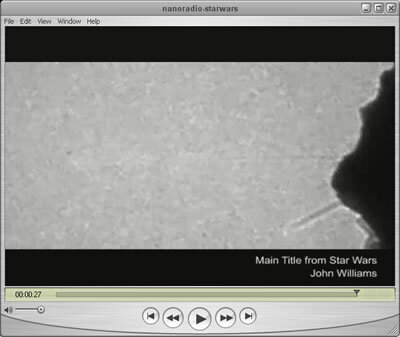 This QuickTime video was recorded on the nanotube radio using a Transmission Electron Microscope. At the beginning of the video, the nanotube radio is tuned to a different frequency than that of the transmitted radio signal so the nanotube does not vibrate and only static noise can be heard. As the radio is brought into tune with the transmitted signal, the nanotube begins to vibrate, which blurs its image in the video but allows the music to become audible. The song is the theme music to Star Wars by John Williams. To see and hear the nanotube radio, click on the image. 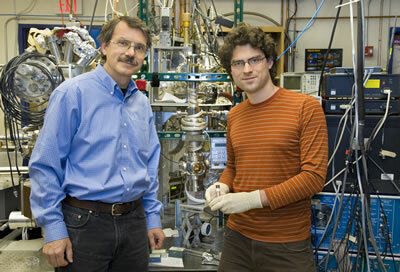 Alex Zettl (left) and his graduate student, Kenneth Jensen have created the first fully functional radio from a single carbon nanotube, which makes it by several orders of magnitude the world’s smallest radio. Because carbon nanotubes are so much smaller than the wavelengths of visible light, they cannot be viewed with even the highest powered optical microscope. Therefore, to observe the critical mechanical motionof their nanotube radio, Zettl and his research team, which in addition to Jensen, also included post-doc Jeff Weldon and graduate student Henry Garcia, mounted their nanotube radio inside a high resolution transmission electron microscope (TEM). A sine-wave carrier radio signal was launched from a nearby transmitting antenna and when the frequencies of the transmitted carrier wave matched the nanotube resonance frequency, radio reception became possible. All four essential components of a radio, antenna, tuner, amplifier, and demodulator, may be implemented within a single carbon nanotube. A paper on this work is now on-line at the Nano Letters Website. It will also be published in the November 2007 print edition of Nano Letters. The paper is entitled “Nanotube Radio” and the co-authors are Zettl, Jensen, Weldon and Garcia. In that same print edition, there appears a paper by Peter Burke and Chris Rutherglen of UC Irvine, reporting on the use of a carbon nanotube as a demodulator. The nanotube radio research was supported by the U.S. Department of Energy and by the National Science Foundation within the Center of Integrated Nanomechanical Systems.